You're committed to the paleo lifestyle, but does that mean that you need to spend extra time creating special meals every night? 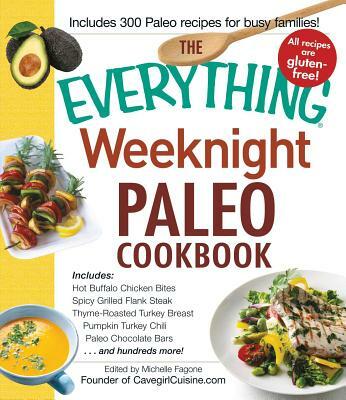 Not with The Everything Weeknight Paleo Cookbook Here, you'll find 300 flavorful, whole-food recipes for meals that will not only satisfy the entire family, but also fit into a busy schedule. The best part is, you'll be out of the kitchen in no time Most recipes can be made in thirty minutes or fewer--some utilize the convenient slow cooker for hands-off cooking, while others are simple make-ahead meals. With these fresh and simple meals in your repertoire, you'll find it easy to transform your body as you enjoy the wholesome tastes of the paleolithic diet. Michelle Fagone is a recipe developer, CrossFit enthusiast, and food blogger. On her site, Cavegirl Cuisine, she shares recipes and knowledge about the health benefits of cooking with local, fresh, noncontaminated foods. Cavegirl Cuisine was named one of the Top 50 Paleo Blogs of 2012 by the Institute for the Psychology of Eating. She lives in Louisville, KY.